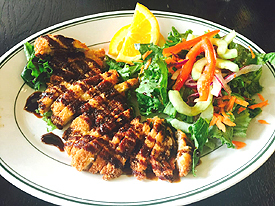 A steady flow of locals and tourists stream in and out of Taka's Grill in downtown Fort Bragg. They have dined on a large variety of sushi, tempura, teriyaki, Japanese noodle soups, and sashimi entrees. Seating is in the cozy dining room with views of busy Main Street Fort Bragg or in the heated garden greenhouse with its lush plants. 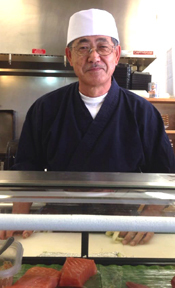 Owners Taka and Maria Takanao met in Los Angelos years ago, married, moved to Fort Bragg to raise their family and opened the restaurant in 2003. Marie loves Fort Bragg stating "I love Fort Bragg because it is quiet and the people are so friendly". Several menus cover the numerous lunch and dinner entrees including Aukino, Oyokadan, grilled miso marinated black cod, oysters on the half shell, and chicken or beef curry rice. Wild salmon is served when available. 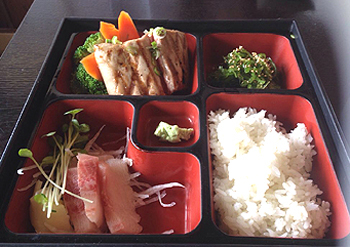 The wonderful Bento boxes include a choice of teriyaki chicken, beef, salmon or ahi served with choice of green salad (cucumber, seaweed or mixed greens) and miso soup with four pieces of California roll. Steamy bowls of Japanese pan friend noodles in a nutrituous broth of veggies and herbs warm the soul. Drinks include Japanese or micro-brewed beer, wine, mineral water, Mexican coke, fruit juices or green tea. Taka is a very skilled sushi chef. Guest can sit at stools and watch him perform his magic. There are over 2 dozen sushi choices. Try Taka's special combination which includes 2pc tuna, 2 pc yellowtail, 2 pc salmon, 2 pc shrimp, 2 pc tuna rolls and 3 pc California rolls. 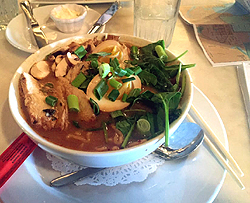 Takas is one of the most consistently open gourmet restaurants in Fort Bragg and a favorite of the locals.